ST. LOUIS (AP) — Vladimir Tarasenko looked quite comfortable at Busch Stadium. It turns out his wicked wrist shot works outside, too. 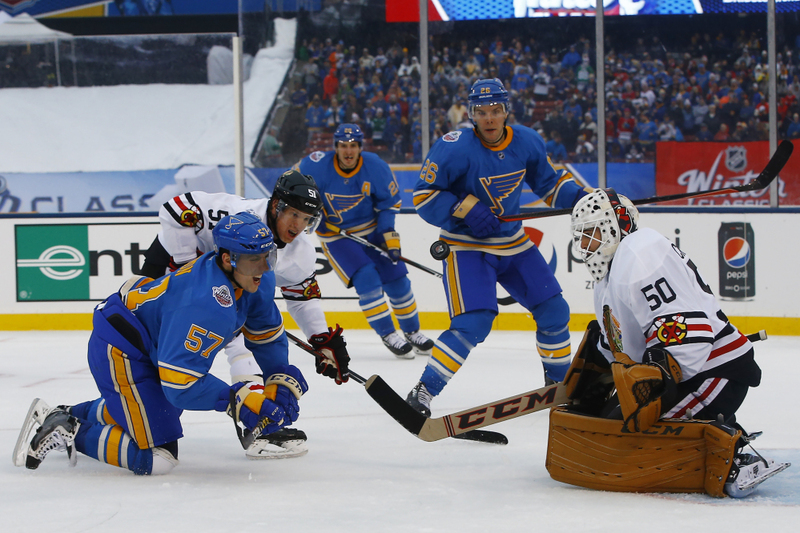 Tarasenko scored two goals in the third period, Jake Allen stopped 22 shots and the St. Louis Blues beat the Chicago Blackhawks 4-1 in the Winter Classic on Monday at the longtime home of baseball’s St. Louis Cardinals. As usual, Tarasenko deflected the attention away from himself. It was 46 degrees when play began before a sellout crowd of 46,556, the sixth largest for a Winter Classic. It was the 21st regular-season outdoor NHL game. Bobby Hull and son Brett dropped the ceremonial first puck. Bobby wore a Blackhawks jersey and Brett wore the Blues sweater. The Blues went ahead 2-1 when Tarasenko made a backhand pass that hit the skate of Blackhawks defenseman Niklas Hjalmarsson and slipped by Corey Crawford at 12:05 of the third. Tarasenko then scored on a wrist shot over Crawford’s shoulder at 13:58, giving him 18 goals this season. Robbi Fabbri assisted on both goals. The Blues added an empty-net goal by Alexander Steen at 18:46 to seal the victory. St. Louis tied it at 1 at 7:45 of the second period. From behind the net, Jay Bouwmeester fed Patrick Berglund in the slot. Berglund one-timed the pass for his sixth goal this season. Steen got the second assist on the goal, the 300th of his career. The Blackhawks scored 62 seconds into the game. Michal Kempny hit a slap shot from just inside the blue line that bounced and wobbled and went off the top of Allen’s glove. Kempny got the puck on a pass from behind the net by Artemi Panarin. It was Kempny’s second goal of the season. He did not score in his first 24 games. Now he has scored in his last two games. Crawford, who faced 34 shots, made his best save when he denied Tarasenko on a breakaway three minutes into the third period.